There could have been so much more to Ralph Sampson's career, but he remains deeply revered by those who knew him best. Ralph Sampson unfolded in front of me. He rose, then seemed to rise again, then again, so tall that the act of standing up appeared to occur in choreographed sections. Granted, this was back in 1980 before I routinely covered men of immense size. I wasn’t used to seeing someone like Ralph. But even now I am in awe of the man’s height, which was officially listed as 7'4" but, for all I know, could’ve been 7'5". I have to call him Ralph. Sampson seems wrong, and not just because of the body type associated with that name. Ralph has always been a one-name wonder, partly because his size and skill made him distinctive, partly because we don’t have many “Ralphs” in our sporting pantheon—I’ll give you a Kiner but not a Drollinger—and partly because that small-town-sounding name just fit him. Barkley is the perfect Sampson foil. 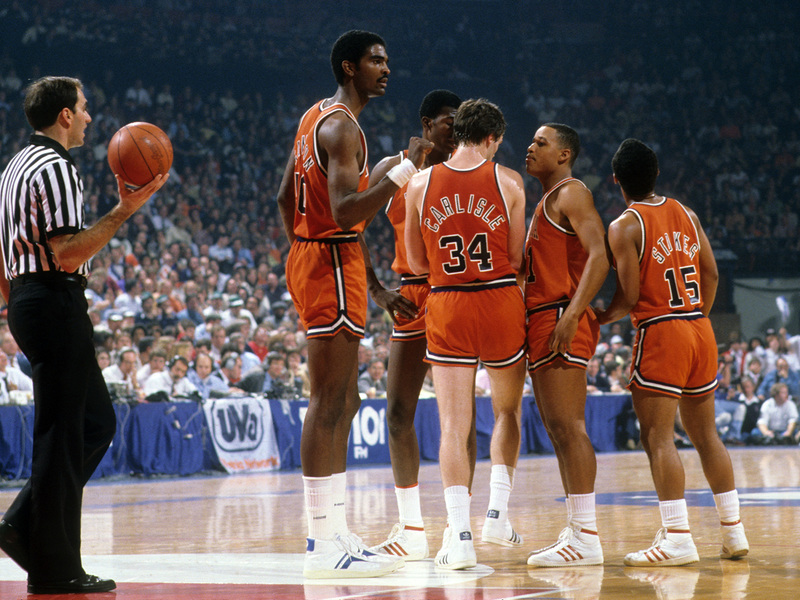 Charles was the Round Mound of Rebound; Sampson was called Stick by his teammates. Charles barreled; Ralph flowed. A crowd was Charles’s oxygen; Ralph, in conversation, always had one eye peeled for an exit route. Charles was a small-town kid who was born for the bright lights; Ralph was a small-town kid who wanted to stay that way. And there’s this: Barkley took a giant bite out of everything and always came away sated, full of life, full of himself. But when I think of Ralph, I see someone … unfinished. It’s not that he’s some sad example of untapped potential or anything that obvious or simple. But there could’ve been so much more. I wish there had been so much more. So this is about Ralph. We can always hear from Charles on his own. Ralph was a freshman at the University of Virginia when I first watched him unfold. I was writing for the Morning Call, a mid-sized regional newspaper in Allentown, Pa., and was in Charlottesville to cover Lafayette College’s NIT game against Virginia. It was a big deal for Lafayette, a big deal for the newspaper and especially a big deal for me, whose only road trips in those days were to the scholastic wrestling championships at Penn State. Doug Elgin was the Lafayette sports information director at the time, but a year later Elgin had become Ralph’s SID at Virginia and I was doing a story on UVA for Sports Illustrated. “Pretty strange how quickly all that happened,” said Elgin, who has been the much-respected commissioner of the Missouri Valley Conference for the last 31 years. On the bus trip down to Charlottesville, I asked Charlie Naddaff, Lafayette’s easygoing center, if he knew how many blocked shots Sampson, the ultimate freshman phenom, had collected that season. “Damn,” said Charlie, a large man, who at 6'10" was still six inches shorter than Ralph. Naddaff and his teammates played well but were handled by Virginia, which won 67–56 and went on to take the NIT crown, back when that was a little more significant. Ralph was the tournament’s MVP. Sampson finished his four-year career with 462 blocked shots, which was not recognized as an official statistic back then but would still be fifth all-time, 19 behind somebody named Tim Duncan of Wake Forest. He also averaged 16.9 points and 11.4 rebounds and, most impressively, won three straight player-of-the-year awards. Bill Walton (1972, ’73 and ’74) was the only other player to have won three, and, obviously, it will never happen again. Guys like Sampson do not hang around campus for four years. Or even two. From the beginning of the tournament Sampson had commanded center stage but once again had to settle for the role not of leading man but tragic hero. Some of his opponents sensed Sampson's burden. "Even before the game I felt for Ralph," said [Thurl] Bailey, "though of course, I couldn't let it affect the way I played. I just thought what he's meant to this game, and how one of the reasons he didn't go pro was to get a shot at a title, and the pressure he must be under. You know, if I wasn't a basketball player, Ralph would be my idol." After the final buzzer against N.C. State, Sampson was left alone under the basket, holding the ball as Wolfpack players, coaches and fans converged at midcourt to celebrate. He took one hard dribble and threw down a slam dunk in frustration. Then he turned and walked off the court, away from the cheering, a direction he had gone before. But the “buts” also carry a but, according to those who were close to Ralph in college and remain so today. Don’t think the decision was easy even if Ralph did like the college life: Not only did he risk losing millions because of injury, but he also ignored solicitations from both the Celtics and the Lakers. Come play with Larry. Come play with Magic. It takes a particular kind of man to tune that out even if you are the RBMOC, the Really Big Man On Campus. Stokes spoke of Sampson’s humility, his thoughtfulness and his ability to bring everyone together. Some of Stokes’s fondest memories were of Sunday dinners cooked by Ralph’s mom in his hometown of Harrisonburg, about an hour’s drive from Charlottesville, and the home of James Madison University, which Sampson actually considered attending before surrendering to the higher-profile lure of UVa. Elgin agreed that Ralph looked more, well, anguished, than he actually was. • There were plenty of tall players who by Ralph’s time had fashioned themselves as away-from-the-basket shooters, legit 6'9" superstars such as Elvin Hayes and Bob McAdoo. Rick Barry, at 6'7", played all over the place, and even 7'1" Wilt Chamberlain had finished up his career as (somewhat of) a high-post player most proud of his passing. But Ralph was so tall—a full three inches taller than Wilt—that people wanted him under the damn basket only. That’s how basketball was played back then. The tall, tall players who were around then—7'5" Chuck Nevitt and 7'4" Mark Eaton—were strictly back-to-the-basket centers, largely because their skill set did not warrant them being far from the hoop. • But while Ralph deserves credit for not acceding to the demand that he plant himself in the paint like a shrub, he never did develop a signature can’t-stop move. He never messed with a sky-hook, he wouldn’t get a baby hook, he didn’t really have a definitive low-post move. Unlike, say, Kevin McHale, who water-tortured his defenders with a slow-motion assemblage of feints and dips, Ralph always seemed rushed in the pivot. He had a really nice-looking jump shot but never became a truly deadly shooter along the lines of a McAdoo. Two words that would’ve helped Ralph: Elbow jumper. Think Kevin Garnett. After Sampson’s first two years he never shot better than 50% from the floor. By contrast, Hakeem Olajuwon, his co-Twin Tower and owner-operator of the Dream Shake Low Post Grocery and Luncheonette, went 13 seasons before his shooting percentage dipped below 50%. True, Olajuwon was the center and Sampson the power forward in their Twin Tower arrangement, which suggests that Sampson shot farther from the basket. But that’s how Ralph wanted it. He never wanted to be strictly a center. Still, Ralph was a great player. He had a spectacular rookie-of-the-year campaign before Olajuwon arrived—21, 11.1, 2.4 blocks—and in the four seasons they were together the Rockets were an elite team, winning 48, 51, 42 and 46 games. With all the talk about the Lakers and Celtics in the 80s, remember that it was the Rockets who took Boston to six games in the 1986 championship series, and that was considered an immortal Celtics team. There it is again. That ’86 series is best remembered for A) an epic free-for-all during Game 5 in Houston involving Ralph and 6'1" Jerry Sichting, and B) the hostile environment in which the Rockets, particularly Sampson, found themselves in Game 6 when Bird and McHale (29 points each and 11 and 10 rebounds, respectively) torched them in a 114–97 clincher. But who knows what indignities Sampson had endured to that point? Most big men—it happened to Kareem Abdul-Jabbar, it happened to Shaq and it even happened to that celebrated pacifist Yao Ming—had a couple games when they just exploded. But this was the wrong time against the wrong team, and then Johnny Most, the grumpy, overrated homer who was revered in Boston, heaved his gallon of gasoline on the fire. “Ralph Sampson is a gutless big guy who picks on little people, and he showed me a gutless streak,” Most rasped into his radio microphone. “That was a gutless, yellow thing to do.” Needless to say, that set the tone for the reception Ralph received in Boston Garden three days later when he scored only eight points and never got to the line in Game 6. Ralph had taken a terrible fall during that season—in Boston Garden as a matter of fact—and hurt his back. Combine that with a couple of knee surgeries from which he returned too soon, and, as a player, Ralph was never the same after the 1985–86 season. Then, too, there was always tension between him and coach Bill Fitch, and early in the 1987–88 season, by which time it was apparent that the Twin Tower experiment was not going to produce a title, Sampson was traded to Golden State. Then it was on to the Sacramento Kings and the Washington Bullets, but that was all just mopup. With aching knees and aching back, Ralph retired in 1992 at 31, but really, he was de facto done four years before that. Ralph struggled after he left the game, never quite able to find his place. It’s a tale no less melancholy for being common. He had issues with his personal finances and child support payments and even spent two months in jail in 2007 for mail fraud. A gig on the Phoenix Suns development staff lasted only one year. All that attaches itself to the Ralph saga and the idea that he never quite lived up. But that is not how they look at Ralph around Virginia. So when I see Ralph this weekend—still rising above the crowd—I’ll try to look at him differently, not as any kind of lost soul, but as a man who remains deeply respected, even revered, by those who knew him best.